This ten minutes clip of Second World War captures an important chapter of Indian army. War stories are usually focused on combat soldiers and support services though vital usually don’t get much attention. However, we all know that if supply corps does not send food in time, a hungry soldier cannot survive even a day or without the help of an orderly of medical corps a minor bleeding wound can end the life of a soldier. This clip provides a window to the role of Royal Indian Army Service Corps (RIASC) contingent in Western theatre in Second World War. Film caught the day to day functioning of animal transport and also tradition of presentation of ‘nazar’ to King. There are three interesting people in the clip. Major Akbar Khan, Risaldar Major Muhammad Ashraf Khan and narrator Z. A. Bukhari. Z.A. Bukhari was from my hometown of Peshawar and his as well as his brother Ahmad Shah Bukhari’s role in early history of Indian broadcasting requires a separate detailed piece. RIASC contingent was K-6 Force. This force was sent to France in November 1939 where it stayed until evacuation in June 1940. It left its animals behind in France during evacuation. It stayed in England from 1940-44 where it worked with horses and mules brought from France and United States. Force came back to India and later went to Burma theatre. It consisted of Force Head Quarters (HQ) and four Animal Transport (AT) companies. Force Commander was Major (Temp Lt. Colonel) R.W.W. Hills and senior Indian Viceroy Commissioned Officer (VCO) was Risaldar Major Muhammad Ashraf Khan, IOM, IDSM. Force was all Muslims mainly Punjabi Muslims of Potohar area with few Pathans and Hazarawal. The discipline and efficiency of the force was exemplary in all phases and all observers praised Indian soldiers. In embarkation and disembarkation everything went smoothly without any loss of animals. In the chaotic retreat from Dunkirk, the discipline was exemplary. In England, the behavior of soldiers was excellent and locals who came in contact with them remembered them even after fifty years. Major Mohammad Akbar Khan was 2IC of No: 25 Animal Transport Company (ATC). In 1947, he was senior most Muslim officer of Indian army and given Pakistan Army number 1 (a detailed profile of Akbar and his family is almost complete). Risaldar Major Muhammad Ashraf Khan served a long career with RIASC. He had received IDSM on North West Frontier in 1935 operations. In France, he earned IOM for his cool and calm attitude during extrication. He received his IOM from the King at Buckingham Palace. In June 1944, he was appointed Ist Class Order of British India (OBI). He was a Hazarawal and belonged to the same area of Field Marshal Muhammad Ayub Khan. He was very well respected by soldiers and junior officers. When Ayub Khan was removed from the command of 1 Assam Regiment in 1945 in Burma and Lieutenant Colonel Steve Parsons took over, Ayub spent next few weeks in the forty pounder tent of RM Ashraf Khan as his guest before heading back to India. The picture below is a rare photograph of RIASC soldiers in England. 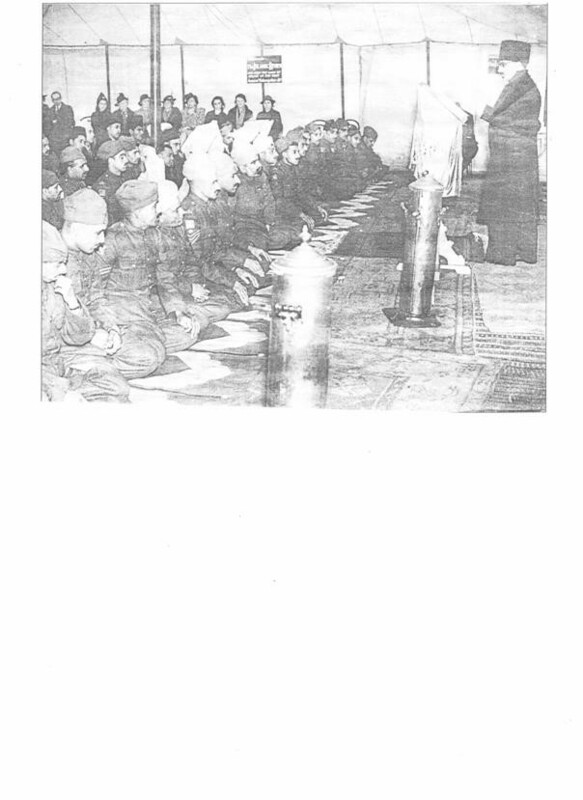 Photograph: Eid ul Azha prayer at Shah Jehan Mosque in Woking, London, 28 December 1941. In front rows are soldiers of RIASC and Risaldar Major Muhammad Ashraf Khan with beard in the center. Picture is from Woking Mission website. There is interesting history of Woking mosque and it is linked with history of Muslim Diaspora in London. This mosque was established in 1913. In First World War, imam of the mosque Maulana Sadr-ud-Din was involved in the care of wounded and dead in England. Initially, British authorities approved for purchase of a burial plot in Netley near Royal Victoria Hospital where many wounded Indian soldiers were treated. Sadr-ud-Din advised them to change the burial site to near Woking mosque. He met Director General of War Office General Sir Alfred Keogh and Military Secretary to India Office General Sir Edmund Barrow. In November 1914, three Muslim soldiers were buried in a section of a Christian cemetery. Later, burial site was selected near Woking mosque. From its inception, this mosque was run by Ahmadi Muslims. They were declared non-Muslim in 1974 in Pakistan and have been relentlessly persecuted forcing large numbers of them to migrate to other countries.